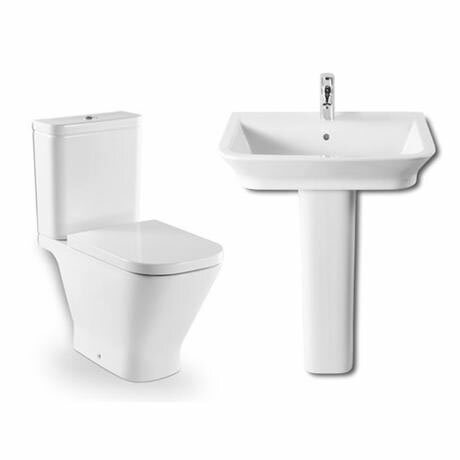 The minimalist designer Roca Gap 4 piece bathroom suite features a close coupled toilet and a 1 tap hole basin with full pedestal, part of Roca's contemporary collection of luxurious vitreous china sanitaryware, with its functional and compact design this bathroom suite provides a modern and stylish solution for optimising any bathroom space. Manufactured by Roca using the best materials and production methods, this means products are more resistant, durable, easy to use and maintain. All Roca ceramics are covered by a 25 Year Guarantee. Supplied with a quality soft close wrap over anti-bacterial seat. The suite also includes a 1 tap hole basin in a choice of two sizes - 550 & 650mm. Basin is designed to be used with a mono basin mixer (sold separately).